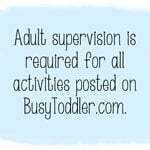 Need a fun, easy toddler activity? Make a flour bin! 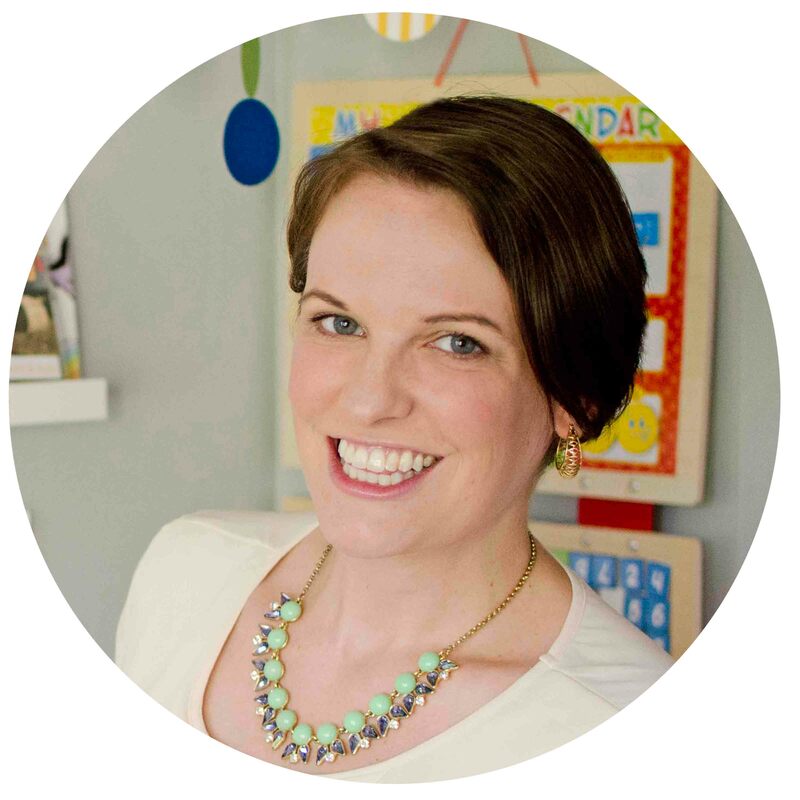 It doesn’t have to be a glamorous activity to be one of the best toddler activities around. And easiest. It’s a little messy, but don’t let that get in your way. 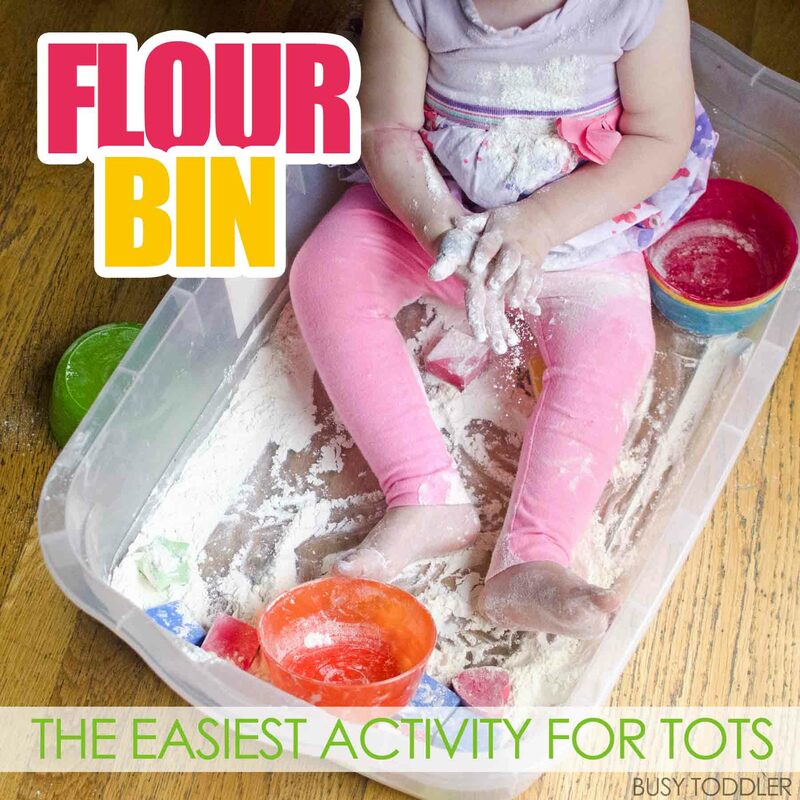 Try a Flour Bin the next time you need something quick and easy to occupy your toddler. 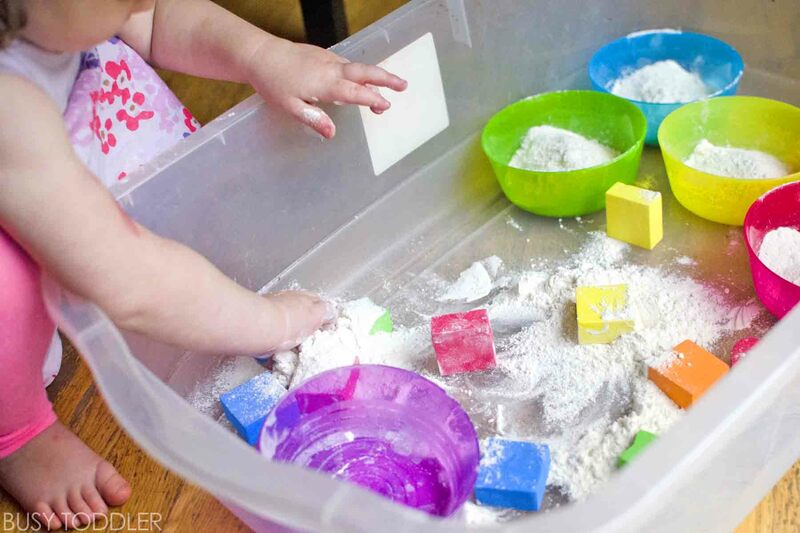 Sensory bins are always a fun way for toddlers to play. They’re especially great for young toddlers as a taste-safe, easy, and fast way to have a little fun. My daughter (18 months old) is addicted to sensory fun. Setting up a flour bin takes seconds! 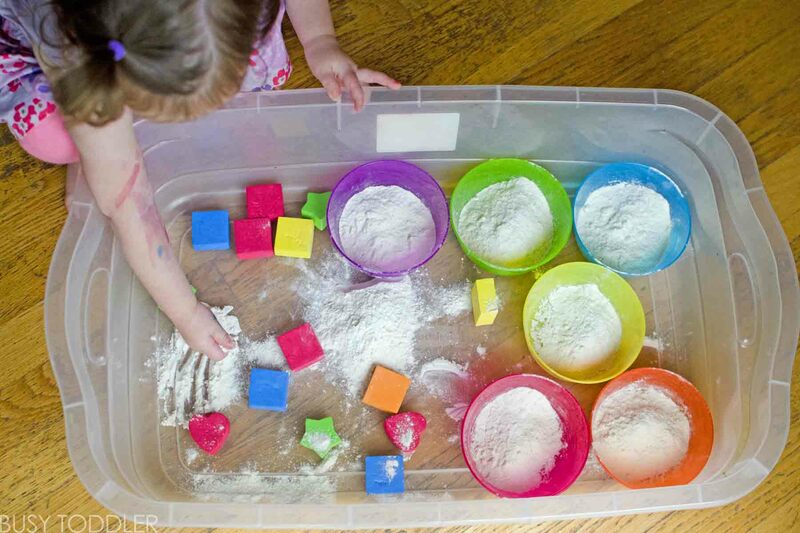 There’s not much prep in this fun little activity: dump a few handfuls of flour into a storage tub and get ready for some one happy toddler. I put some flour in each bowl and set in some little shapes, just for fun. Kitchen utensils, scoops, and spoons also work really well in a flour bin. 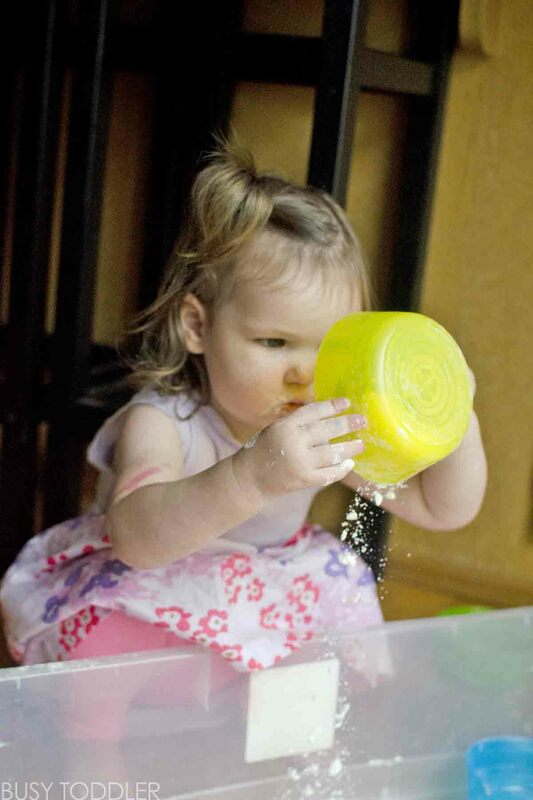 My daughter goes crazy for flour bin every time we play it! She loves the feels of the flour and of course, taste testing all of it. She took special care to dump each little bowl and swirl her hands in it. Look at that wonderful concentration and hard work from such a young toddler. She’s learning so much working with this flour. After each dump, she would carefully refill the bowl with more flour – had to get back to work! Piling the flour on top of the shapes was also her favorite part of this bin! Flour bins always buy me so much time when I put them together. It’s a fast way to hold a toddler’s attention. And of course, it wouldn’t be a flour bin, if my toddler didn’t get in the flour bin. She always does! Oh well, flour washes off easily, it wipes up fast, and everything comes clean quickly. 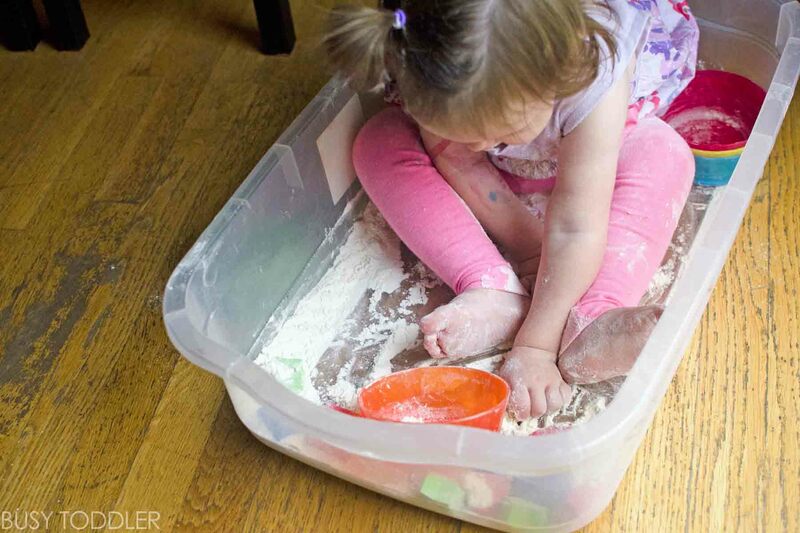 It might be a bit of a mess, but the flour bin is a safe bet to be a toddler hit at your house. 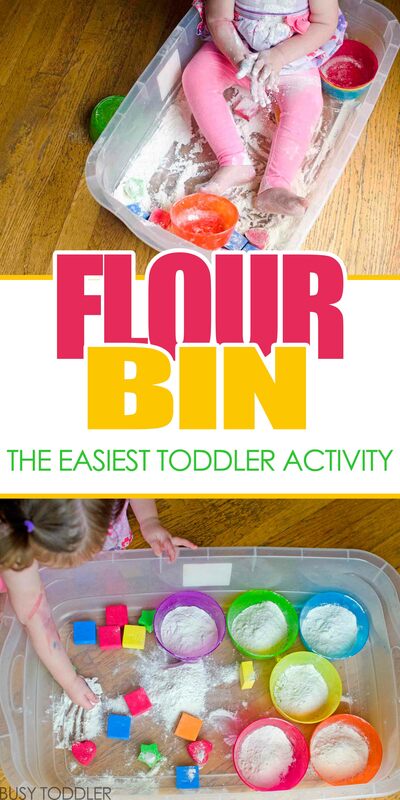 Think your toddler would like a flour bin? 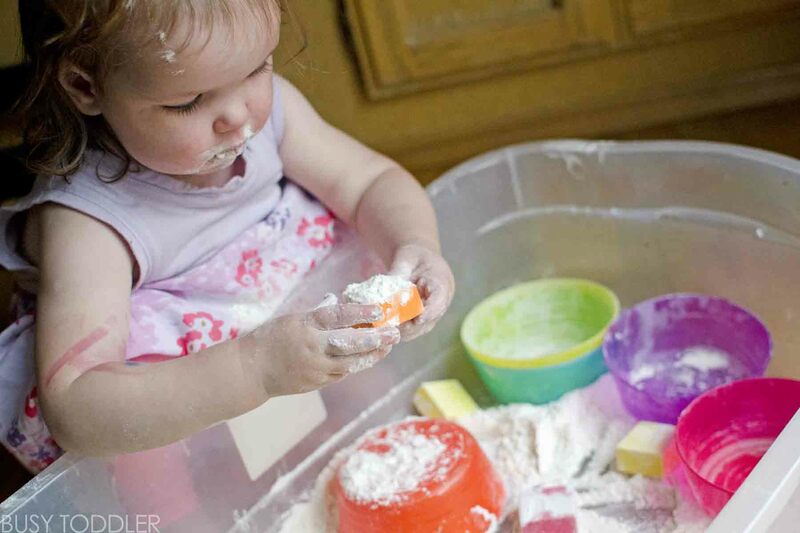 Ooh fun messy play! So far my kiddo doesn’t like the feel of weird new textures. He was very anti playing with sand, so I don’t think he’ll like flour. But I need to try more things like this on weekends when we’re home together.